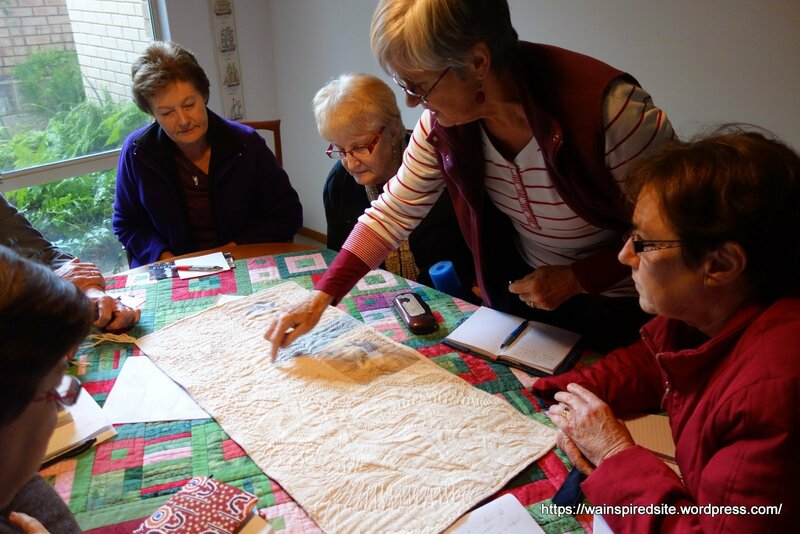 We are a group of quilters in Perth, Western Australia whose purpose is making art quilts for exhibition – not in quilt shows but in galleries and public buildings etc. The group members are: Hilary Arber, Roberta Chantler, Meg Cowey, Pat Forster, Elizabeth Humphreys, Stephanie Knudsen, Stella King and Denise Mallon. We agree on sizes and themes for the quilts, then work individually initially, to ensure variety in what we create. We have made, exhibited and sold three series of quilts which can be seen on this website. Our fourth set ‘Noongar Country, Wetland Glimpses’ was launched in Albany and is currently travelling between a variety of venues. Looks great! Good on you. Thanks Julie. We have fun! Love the selection of quilts that feature on the greeting cards purchased recently! What a pleasure to give to a friend. Patrica, you are welcome, and a good friend! Lovely to meet Elizabeth Humphreys at AQC and hear about your little group.